Jm Special Wynn, under jockey Sergio Becerra, Jr., winning the 2014 $100,000 All American Juvenile at Ruidoso Downs over the lies of Grade 1 winner Cobalt Creek, etc. CHAMBERINO, NM—JANUARY 27, 2019—Jm Special Wynn SI 92, a Ruidoso stakes winning son of leading sire Walk Thru Fire, is standing the 2019 season at The Quarter Company, near Chamberino, New Mexico. His fee has been set at $2,500. Bred by Dr. Steve Burns, DVM and raced by J & M Racing and Farm, Jm Special Wynn won or placed five of nine career starts and earned $87,773. He won the All American Juvenile Stakes and was a finalist in the Grade 1 Ruidoso Derby. His first 2-year-old crop will race in 2019. Jm Special Wynn returns to the winner's circle at Ruidoso Downs following his victory in the $100,000 All American Juvenile. Jm SpecialWynn is a full sibling to four black type runners including stakes winning track record holder Fly Thru The Fire SI 108 ($144,125), Evergreen Park Derby Challenge winner and G1-finalist Wrap You Up SI 104 ($80,380), G2-placed Just Walk By SI 90 ($80,750), stakes-placed G1-finalist Gronkowski SI 97 ($79,589 to 4, 2018), and stakes-placed G1-finalist You Can Fly SI 93 ($54,247 to 5, 2018). Jm SpecialWynn's sire Walk Thru Fire has sired 8 champions, 77 stakes winners, earners of $36.5 million to include Heza Dasha Fire SI 105 (World Champion to 6, 2018, $2,240,112, Champion of Champions-G1, etc. ), Last to Fire SI 105 (World Champion, $1,145,254, Champion of Champions-G1, etc. 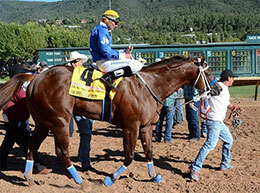 ), Higher Fire SI 103 (champion twice, $1,314,742, Ed Burke Million Futurity-G1, etc. 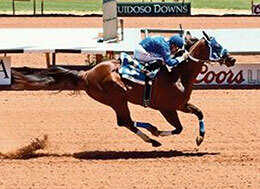 ), Walk Thru Crystal SI 95 (champion, $675,855, Ed Burke Million Futurity-G1, etc. ), etc. Jm Special Wynn's dam is the "blue hen" mare Babe On The Fly SI 101 ($246,111), a G1-placed daughter of leading broodmare sire Strawfly Special. She is the dam of 23 winners, 27 ROM, 12 black type. In addition to Jm SpecialWynn's full siblings (see above), Babe On The Fly is also the dam of Ruidoso Derby(G1) winner Rock You SI 102 ($790,325), Golden State Million Futurity(G1) winner Little Talks SI 94 ($563,897), Ed Burke Juvenile winner Ali Babe Foose SI 96 408,613), California Breeders' Sprint winner Carne Vino SI 92 ($88,805), G1-placed Glock SI 96 ($217,193), and stakes-placed G3-finalist Annas Babe SI 88 ($40,330), etc. She is granddam of Governor's Cup Futurity(RG2) winner Ajs Annas Smoke SI 93 ($249,119 to 4, 2018), etc. This is the immediate family of All American Derby(G1) winner Dont Let Down SI 103 ($697,769), Mr Jet Moore Stakes(G3) winner Apollitical OK SI 99 ($276,454 to 5, 2018), Grade 1 winner Eye Caughtcha Peekin SI 100 ($201,942), stakes winner Fabulous Figure SI 111 ($270,112), etc. For additional information or breeding contracts call Jennifer Moore, farm manager, at (505) 933-1016.